Developers are seemingly constantly finding new ways to use the Oculus Rift and the shifted perspective it provides players. Greenwood Games have hit on something with their horror game alone. When you slip on the Rift you find yourself sat on a sofa in a living room playing a game on the television before you. That doesn’t sound so horrific. It’s when things in the game start slipping into the living room that you’ve cause to be afraid. If you have a Rift developer kit already I’d suggest skipping the rest of this post and simply trying out the demo of the game for yourself. The way it works is that you’re alone in a large empty house in a forest, all the windows are open and the lights are off. In front of you is a television playing a copy of a horror game, The Witching Hour. 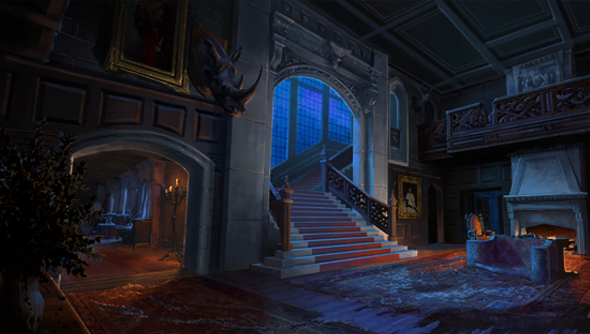 Set in the 1800s, as you play you come across notes about what horrors have taken place in the manor. The notes feed hints to you about what you should listen out for. You learn about the body being dragged across the floor in the attic just as you hear that same sound in the game. The sound’s not coming from the television, though, but from the ceiling above you in the virtual house. Reports have it that this game within in a game construct is more immersive than other games on the Rift. In the case of VR Brotherhood he felt no compulsion to take the Rift off and search out the sounds in the real world, as he usually does with horror games, instead treating the virtual home environment as real. As exciting an idea for a game alone is, and it is definitely that. I’d like to see other studios take it further. At Gamescom I was able to try out Oculus’ virtual cinema software. It seats you in an empty cinema and throws up any .avi file you have available onto a virtual screen. It’s an eerie experience watching a film in that way but it had me forget pretty quickly I wasn’t actually in a cinema. Now if production companies coupled that virtual cinema with what Greenwood are doing in Alone you could see special releases of films where the cinema could alter to fit what was going on onscreen. Fill the cinema with fog when the film took the action into the swamp. Have shadows flicker across the walls but have the person casting them always be just out of your vision. It could make for something completely enthralling.